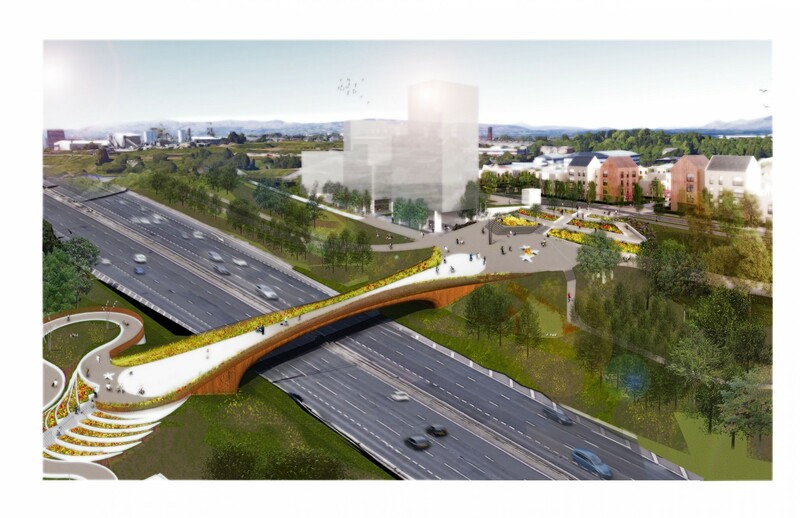 Glasgow City Council is preparing to file a planning application to create a new pedestrian and cycle link spanning the M8 to better connect communities to the north with the city centre. Dubbed a ‘Street in the Sky’ the walkway will reduce walk times between Sighthill and George Square to just 15 minutes, with new landscaping further enhancing the attractiveness of the north/south connection. 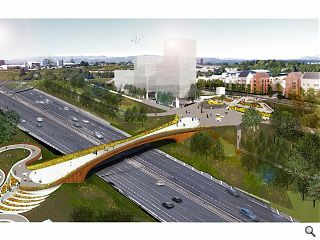 Designed by Jacobs the bridge is a crucial element in the delivery of the £250m Sighthill Transformational Regeneration Area and is expected to commence construction by mid-2019 for completion by the following summer. Stretching 58m across the road below the hourglass form link will take the form of a steel box girder with a reinforced concrete composite deck slab, a solution which will require minimal ongoing maintenance. Councillor Susan Aitken, Leader of Glasgow City Council, commented: “For far too long, neighbourhoods just on the periphery of the city centre have been forgotten or abandoned. Sighthill has typified this neglect, cut off from the heart of the city by the M8. Upon completion Sighthill will include its own school, a separate road bridge over the Glasgow-Edinburgh main line and a 'canal terrace' at Pinkston Basin. Absurd in the extreme -- complete joke of scheme wasting scarce public sector resources on a architectural monstrosity. 2000 tonnes of concrete needed to build it -- so much for its carbon footprint. Not just an architectural ego trip, a political ego trip but the structural engineers are on the glue as well. All this sort of redevelopment does is generate public sector ridicule. The whole project is a sham. Just an excuse to build over Sighthill Park and cut down hundreds of mature trees. Then replace it with a multitude of saplings and a warren of big verges and claim it is a linear park. It is city centre expansion rather than regeneration. Bloke, any place north of M8 is as nice to visit as Chernobyl, so anything to revert this trend is more than welcome. Point for you for ripping the mature trees apart and replacing with crap similar to Cathedral Street/Townhead epic failure - developers should plan with this real greenery in mind. 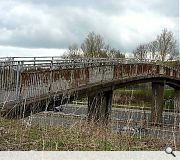 As for the bridge, it has been withdrawn from tendering by GCC in early summer, putting this on hold and redesign. Funny thing is that this will connect one no-go area with another, which is either a genius idea kickstarting the trend or utter stupidity and waste of public money. Will wait and see the application before commenting on other than the marketing. It's a bridge, not a street. It is unlikely to form a continuous multi modal link to George Square. However if it is a continuation of North Wallace Street, why does it narrow? If this is in the sky then the sky has fallen, which is rarely seen as anything other than a disaster. It doesn't carry cars because it doesn't need to. It's 15mins to the city centre, there's a southbound A road right next to it and they rightly want to promote walking and cycling. Either you want to regenerate the post-industrial areas of Glasgow, or you don't. We can debate the aesthetic merits of the architecture, but I can't believe the negativity towards a project trying to inject life into an area as decimated by decline as the north of Glasgow. This is progress, and ambitious. Let's applaud it. I agree with #5 Mike! We must work towards regenerating the less attractive aspects of our cities, make people feel safe and encourage them to walk. Maybe you don't like the design and that aspect can be up for discussion but the existing bridge is poor quality, doesn't encourage movement or accessibility for those who aren't physically abled and you're never going to join the city up unless these types of connects exist. 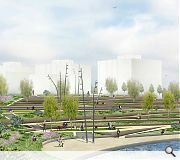 I especially like the landscaping proposals working in together the existing canal. Canals are an attractive feature everywhere else in the world, so why not Glasgow? It minds me slightly of the Helix Park in Glasgow which has been a great hit especially in the summer. This is social cleansing rather than regeneration -- Replacing a failing estate with new city centre friendly housing units. City centre friendly both in design and location as Sighthill Park is obliterated and covered over in concrete. 95% of the existing housing units have been demolished -- where did the existing population go and who will replace them? Land grab to push the existing tenants further out into the sticks and replace them with a more affluent / middle income customer base. The only thing missing is an avenue to take the lycra wearing cycling hipsters straight onto Sauchiehall Street. Plus the bridge is so bad BoJo wouldnt have had the brass neck to put it forward. Good to see that GCC Nats have got their priorities right....Just about the biggest load of tosh that I've seen eminating from the George Square Kremlin in many years. Might I suggest that Sighthill would be better served by GCC investing in housing, employment, education and health (including educating people how to be healthy), rather than this piece of hubris. 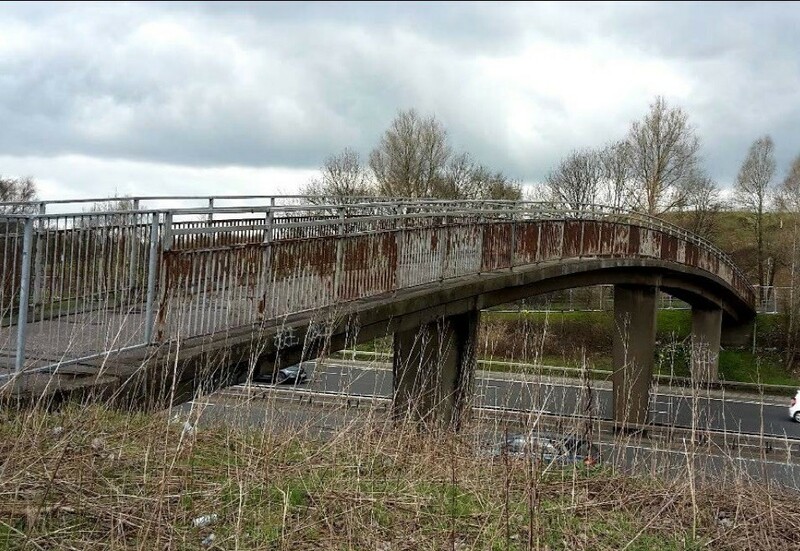 It is not the 'highline' or a 'street in the sky', its a vastly expensive, ill conceived, bridge connecting 2 windswept, no-go areas. #8 "investing in housing" - that's literally the whole point. Then need the houses to be accessible to allow them to pursue a healthy lifestyle, access employment etc... hence the pedestrian bridge. can't denounce it as a no go area then attack plans to... make it not that. #9 Don't go introducing logic, can't you see the man's made up his mind? #10 true walt has a one track mind and it disnae agree with most sensible folk.